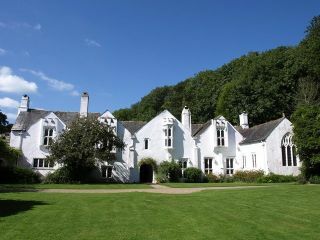 Bradley Manor House is a surprisingly complete medieval manor set in lovely woodland. The house contains collections of Arts and Crafts furniture and Pre-Raphaelite paintings. The earliest part of the house dates to the 13th century, but the majority is of 15th-century design. Archaeologists have found evidence of human habitation at Bradley since the Stone Age, and remains of an Iron Age fort have been found on the hilltop overlooking the manor house. The house itself dates to the early 13th century, but that early hall house was rebuilt after 1402 by Richard and Joan Yarde. The early 15th-century house was extended again in the late 15th century. The house is built of local limestone rubble, attractively whitewashed so that it seems to gleam. The house is built to an L-plan, with the 13th-century hall used as a rear wing. The house is two storeys high, with the original first-floor hall reached only by an external stair. The 13th-century hall was rebuilt as a kitchen, with a huge fireplace in the south wall. A screens passage is lined with 17th-century panelling brought here from the Mermaid Inn at Ashburton. There is another 16th-century screen with linenfold panelling and arabesque decoration in the hall. One of the highlights at Bradley is a series of stencilling from the late 15th century. This original medieval decorating scheme includes a pattern of fleur-de-lys, a sacred IHS monogram, and a striped curtain. There is also very finely crafted plasterwork and a 17th century overmantle with heraldic designs. Linked to the house is a small chapel, with written records dating to 1428. The chapel was robbed at the Reformation, and subsequently suffered the indignity of being used to house chickens. It later served as a dining room and billiard room, before reverting to agricultural use. It was restored to its original state in the early 20th century. 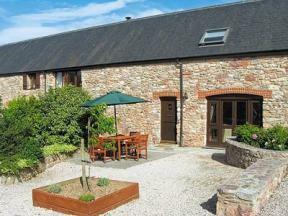 The manor is set in a secluded estate of limestone woodland and meadows, yet is only minutes from the centre of Newton Abbot. Bradley Leat runs near the house. This small stream used to feed water to the estate mills.